If you love the beauty of a well maintained garden but just do not have the time or expertise to achieve it, Countryside Landscape & Design can help you make that happen. We have a team of dedicated and knowledgeable professionals that are able to bring your plant beds to vibrant life, and keep them thriving through the seasons. If you are an avid gardener, and don’t want to turn over all the aspects of gardening that you enjoy, we can alieve you of the tasks you’d rather not spend time on. As every service we offer, it can be tailored to suit your needs. When installing a new lawn, there are many factors to consider. The first is whether to seed, sod or hydro-seed. Sodding is essentially transplanting a mature turf that has been cared for by a professional. Seeding involves the same preparation of soils used in the establishment of sod and can be accomplished by a professional or the homeowner. The number of variables involved in seeding make it difficult and many times unsuccessful for the homeowner. Hydro-seeding is a one-step mechanical method of applying seed, fertilizer and mulch with a tackifier to hold products in place. Loam is a classification given to soil that contains relatively balanced amounts of sand, silt and clay. Classification as a loam soil has nothing to do with the organic material it contains or where it is found. A mixture that contains almost equal amounts of sand, silt and clay is referred to simply as loam. However, if the soil has slightly more of one of these elements in relation to the others, then the classification is modified to sandy loam, clay loam, silt loam, sandy clay loam, or silty clay loam. For best results Countryside Landscape & Design tests the pH of our loam to ensure it is at correct levels. Seeding: the best time to seed is April through May; or September through October, when the day time temperatures are lower and the conditions are more favorable for better establishment. However, it can be done anytime during the hot summer season, but will require more attention. Consistent watering of the new site is essential for root germination and establishment. Ordinarily, 6–12 weeks of growth are needed for establishment. 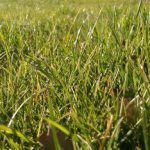 It takes nearly a full season or more (up to 18 months) for the new lawn to be a mature and durable turf able to withstand considerable traffic. Over-seeding is the planting of grass seed by mechanical means, directly into existing turf, without tearing up the turf, or the soil. It’s an easy way to fill in bare spots, improve the density of turf, establish improved grass varieties and enhance your lawn’s color. Sod requires careful attention, proper handling and installation. Sod must be as fresh as possible, and should be cut no more than 24 hours prior to delivery. Once delivered, the sod should be laid as soon as possible, or within one day after delivery. It is critical that it is watered as soon as it is installed. Keep the sod moist but not saturated. Aeration may help to prevent layering and compaction caused by thatch or soil that came with the sod and will improve the soil profile. Aerate after establishment in spring or fall, to at least a depth that goes through the sod and penetrates the existing soil layer, 3”-4”. Aeration controls thatch, improves root systems, and allows air exchange in the soil. 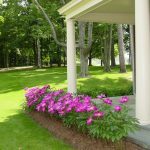 Once the lawn is established, it will provide its many benefits such as cooling effects, erosion, runoff control, and allergen reductions. Hydro-seeding or hydraulic mulch seeding, is a planting process that uses a slurry of seed, fertilizer and mulch that is applied in one step. It is often used as an erosion control technique on construction sites, or as an alternative to the traditional process of broadcasting or sowing dry seed. The slurry typically consists of a mixture of wood fiber, seed, fertilizer, and stabilizing emulsion and is applied with hydro-mulch equipment. This type of application temporarily protects exposed soils from erosion by water and wind until the seed has germinated. To provide outstanding results, we have dedicated crews bringing experience and expertise for your lawn-care needs. Our mowing crews can tackle all sizes of lawn, with eXmark® zero turn and walk-behind mowers, that provide a 52” or 60” wide cut. We recommend a cutting height of 3-4”, with clippings remaining which will return nutrients to the soil as they decompose. Each lawn is finished properly, trimming around lawn edges where needed with a string cutter (weed whacker) and all walks and decks blown to remove grass trimmings. Services for field mowing of meadows and DR mowing to control invasive plants and trees are also available. Our maintenance crews can assist with some or all aspects of your landscape needs. Planting, weeding, edging, mulching, cutbacks—are all offered. It is recommended to be scheduled for routine services to ensure your needs are accommodated. Please contact the office at 413.458.5586 for information regarding scheduling services.